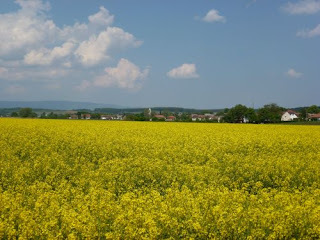 My new life in Burgenland: Goethe And Mellow Yellow. 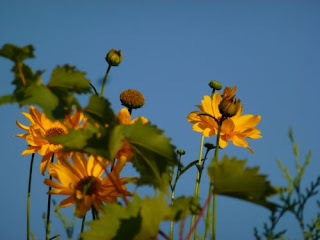 It seems that Goethe advised donning yellow hued glasses to blast the winter blues away. True or not, I am going to give it a try. Already my sunglasses have a slight yellow-brown tinge and they do feel fantastic every time I put them on. No, actually I feel better surveying life through them. Gosh, I wear them even when it's overcast despite facing the odd ridicule. Well, now I have a proper explanation. Fielmann, the place which Bob, I and the rest of our family have discovered and supported is a great place to start. Having a pair of optical glasses made up costs a mere euro 17,50 ( including frames etc ) and hopefully they can make me a pair of yellow tinted glasses. Winter is almost ready to move to better pastures but the last bit of it is not for the faint of heart and frankly, it might be a good idea for Bob and I to grace our village with groovy yellow glasses. Might start a trend.
" Let's go inside, it's too hot and there are too many mosquitoes. " A bit of yellow to mellow your winter blues.